Perfect for summer grilling! Our easy to follow, protein packed, grilled chicken kabob recipe is a fun way for the family to enjoy chicken breast- As well as a quick way to meal -prep for the week. Chop onions and peppers for skewers and sit aside. Turn on grill pan Med-High heat. Clean chicken breast with fresh lemon and water. Rinse chicken breast and place on cutting board. Season to taste and lightly coat with olive oil. Add chicken breast to pan and grill for 6-8 minutes each side; or until juices run clear. Once done, remove chicken breast and set aside. Lightly coat chunks of onions, peppers, and mushrooms with olive oil & add to grill pan. Cook to your liking. Cut chicken breast into chunks to add to skewers. 10. 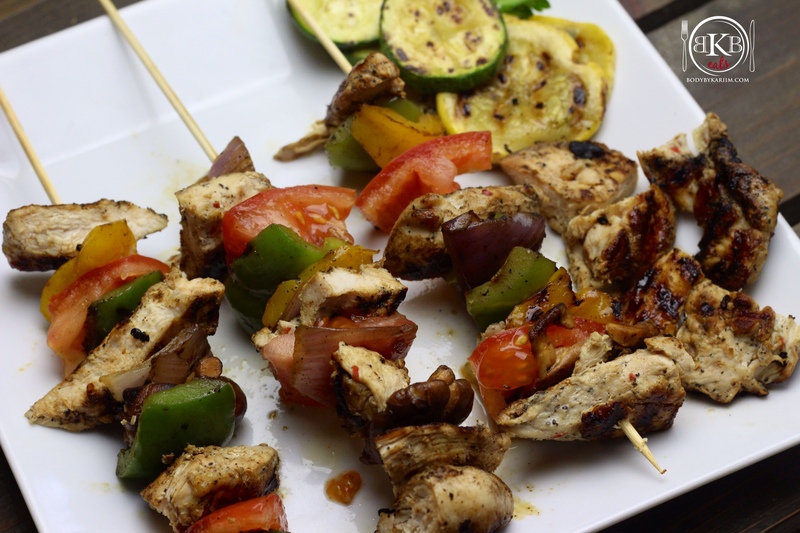 Begin to add chicken breast along with onions, peppers, and mushrooms to the skewers in any order you choose.